← Prophet Muhammad: What Most Non-Muslims Don’t Know ! 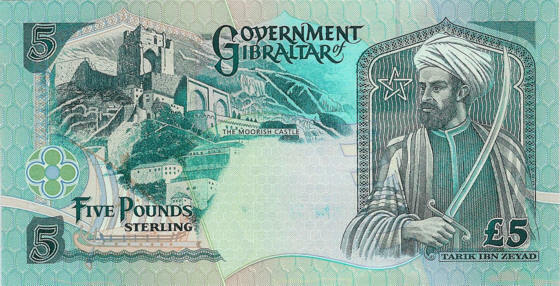 An image of Tariq ibn Ziyad, the Muslim general who first crossed into Spain/Andalus after whom the place is named (“Gibraltar”=Jabal Tariq) on the currency of the U.K. territory of Gibraltar in the Iberian Peninsula. This was definitely interesting to see. What’s to the left is The Moorish Castle is the name given to a Medieval fortification in Gibraltar, made up of various buildings, gates, fortified walls and its most dominant features, the Tower of Homage and the Gate House. The Moorish Castle’s Tower of Homage in Gibraltar. Tariq ibn Ziyad (Arabic: طارق بن زياد‎, died 720) was a Muslim Berber general who led the Islamic conquest of Visigothic Hispania in 711-718 A.D. He is considered to be one of the most important military commanders in Iberian history. 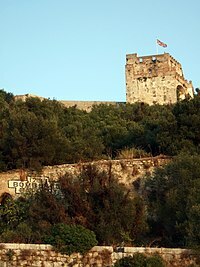 Under the orders of the Umayyad Caliph Al-Walid I he led a large army from the north coast of Morocco, consolidating his troops at a large hill now known as Gibraltar. The name “Gibraltar” is the Spanish derivation of the Arabic name Jabal Tāriq (جبل طارق), meaning “mountain of Tariq”, named after him. Gibraltar is a British overseas territory located on the southern end of the Iberian Peninsula at the entrance of the Mediterranean. It has an area of 6.8 square kilometres (2.6 sq mi) and a northern border with Andalusia, Spain. The Rock of Gibraltar is the major landmark of the region. At its foot is the densely populated city area, home to almost 30,000 Gibraltarians and other nationalities. According to the 2001 census, approximately 78.1% of Gibraltarians are Roman Catholics.